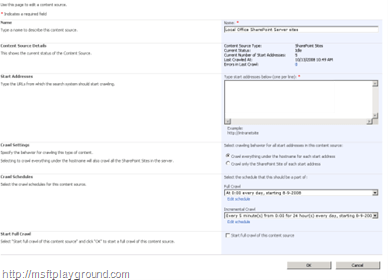 This is a walkthrough for the configuration of SharePoint Search. Select you ‘Shared Service Provider’. They are listed at the left side of you screen in the middle. In the screen that follows content sources are defined. Standard there is one content source, this is the ‘Local Office SharePoint Sites’ content source. Select the content source or create a new content source for crawling your sites. 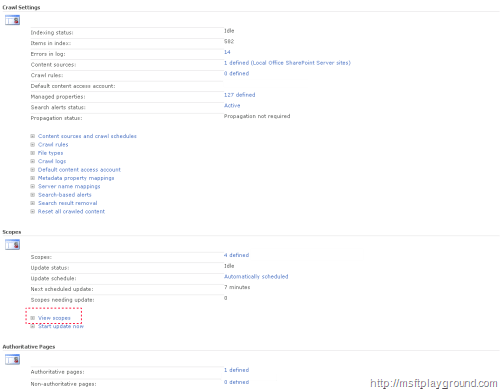 In this screen the settings of the content sources have to be filled in. Besides that you have to schedule a crawl before items appear when you start searching. Name The name off the content source. Content Source Details The details off the content source are displayed here. Start Addresses Here you have to fill in the urls off you web applications that you want to crawl. 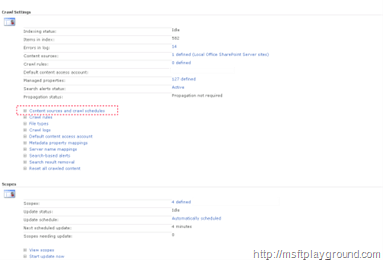 Addresses can be filled in with the http:// prefix or the sps3:// prefix. When you use the sps3:// prefix your users will be crawled. Crawl everything under de hostname for each start address. 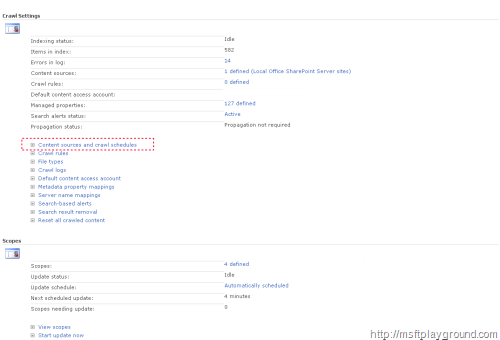 Crawl only the SharePoint site of each start address. Crawl Schedules The crawls can be scheduled here. You can schedule an incremental crawl or a Full crawl. Start Full Crawl Option for starting a full crawl. On the ‘Search Settings’ screen select the option ‘View Scopes’. The title and description you want to give to the search scope. When the scope is created you have to define a role for the scope. When you have clicked ok to save the scope you will return to the ‘View Scopes’ page were you new scope will be displayed. The scope only has an update status of ‘Empty – Add Rule’. Content Source The content source were the rule applies for.